← Mission Impossible “salvation”: Lordship “salvation” — Demanding the Impossible! What a glorious time in Heaven for Ray Stanford today.. at age 95, taken instantly from this corrupt earth of pain and problems to the presence of our Savior he so loved. He will be meeting with hundreds if not thousands who are there because of his faithfulness and clarity in sharing the Gospel of salvation by Grace through personal faith in Jesus Christ alone. I thank the Lord often, remembering that Ray presented the Gospel of salvation in Christ clearly enough for me, a former atheist to trust Christ as my Savior. It was December 15th, 1964 at a Florida Bible College (FBC) Christmas Concert at the old Grove Community Church in Miami, FL. I am eternally grateful to Ray, who founded and was President of FBC. Ray was a dear friend. Now at almost 83, and relatively soon, I will join him and the throngs rejoicing and praising our Savior. On this web site and via private emails, I regularly hear from folks all over the country who regret not having had the opportunity of attending FBC or having the privilege of sitting under Ray’s Bible teaching. He had the God given gift of a master soul-winner, evangelist and teacher — which he used at every opportunity. Please be praying for all of Ray’s family as they reminisce and celebrate the life and graduation to Heaven of a faithful soul-winner and teacher. Please be praying that the Gospel and an invitation to trust Christ will be clearly explained at the services — for souls to be saved for our Savior. This entry was posted in Assurance, Assurance of salvation, Bible, Christian, Christianity, Eternal Security, Faith, Grace, Hope, Joy, Religion, Salvation. Bookmark the permalink. What a wonderful story…. Praise God for His goodness…. Thank You Lord. Wonderful to hear from you!! Yes, I certainly do remember you and your lovely wife Jan. You have a good memory — 1964 — and I probably shared my faith in Christ with Jan in 1964 or ’65 right after I trusted Christ as my Savior (’64). I was thrilled she was already a believer — I knew so few believers at that time except for the Believer’s fellowship at Stanford’s Grove Community Church. 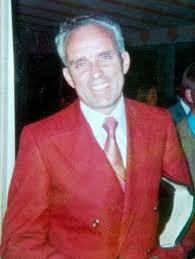 I started attending Florida Bible College full time in about 1966-1967 and hired all Bible College students. Graduated in Dec 1971, sold the business and founded Palmetto Bible church in Perrine. I’m now retired and will be 84 in June. This ministry and my dear wife, Shirley, are now my life since I am in ill health and physically visually impaired — But “I once was blind but now I see” by God’s Amazing Grace. I happened upon your website looking at what there is about Ray Stanford on the Internet. Do you remember Ray and Jan Ross when you were providing pest control service to our home in 1964? In 1950 Ray Stanford caused me to realize how I needed Christ and showed me the way. Good to know of you again. Everything that was predicted to happen before the Rapture of Believers has happened. Scripture indicates it could be any day. Yet Scripture also says we cannot know the day nor the hour. So we wait (serve) and watch, sharing the Gospel with the lost — because we know their eternal destination if they reject Jesus Christ as their Savior. Thanks for your question. No, the late Dr. Ray Stanford was not Arminian in his theology. He believed and taught the Free Grace Salvation message of the Bible (Ephesians 2:8-9; John 3:16-18; Acts 16:30-31). Along with his Free Grace message, he taught the Eternal Security of the believer in Christ (John 10:27-30; Romans 8:38-39). Welcome swatdoc! Thanks for that wonderful word of tribute and testimony. I was a teenager when first heard the simple clear explanation of salvation at a Coral Gables FL ranch. I followed Ray and his teachings until I left the state for college never forgetting the way he spoke and taught. I would have never known the Lord or been saved without his teachings. I am now 60 years old and still remember Ray. God Speed Ray I will see you again some day in heaven. Thanks for providing me the information. Dear Eddy, you can also find what the Heaven Tract looks like in 2 other places. First click on http://www.eph289.com and then click on English…this will take you to the tract. Then if you, from that same website click on Handbook of Personal Evangelism which then you must click on English to see the English version of the book. This will take you to the index page. Then click on chapter V (5) and you will find the tract there also. If you want another place to order this tract, write or call Wally Morillo, Dr. Ray Stanford’s son-in-law for your order. His address is 132 N. Sugar Rd. Pharr, TX 78577 or call him at 956-460-6175. He may be busy the next day or two with Dr. Stanford’s passing but I am sure he would be glad to talk to you and send you some tracts. No the “Heaven Tract” is a small pocket size three page leaflet that we use to share and leave with the person. The article of which you speak of is much more comprehensive Gospel message. I order my tracts from my friend Dr. James A Scudder’s ministry, Victory in Grace and attach my own label, name, address, phone and web site at the bottom. Contact that ministry here: 1-800-78-GRACE or go to their web site at http://www.QRM.org — and click to the About link to send them an email request. I have an interactive facsimile of the tract on my other web site which, while not as complete as the tract, will give you a good idea of the tract. While not perfect, I find tracts are a good “foot-in-the-door” approach to witnessing — and if they don’t want to talk further, at least they can carry it home and call me later if he/she wishes. Is the “Heaven Tract” and Jack’s “The Only Way to Heaven – Guaranteed” gospel tract one and the same? Excellent news indeed. Please forgive me for my ignorance. Where can I find that mysterious “Heaven Tract”? I’ve never heard of that before? Wonderful!!! One more soul for our Savior… And maybe you know — before FBC or any other ministry of Ray Stanford, he and several others toured free Cuba handing out Heaven Tracts and sharing Christ from — his motorcycle!! Keep up the tradition!!! Continue the good work for the Lord… Great to hear from you.. Come back and comment often. Yesterday evening (Wed.) I went to a Bible study on my motorcycle. On the way home, due to some crud in the gas tank the cycle quit. I pushed it to a gas station and fiddled with it trying to get it restarted. A young motorcyclist asked my how it was going and I told him not so well. He came over to help me and to make a long story shorter, after giving him a Heaven Tract and the Gospel, Ray Stanford style, this 20 year old trusted Jesus as his Saviour!! This was probably the first time Ray got to see me lead anyone to the Lord as I think maybe he can look down from Heaven. The young man followed me home to make sure I made it (which I didn’t..he had to help push me about 1/2 block to my house. I had already shown him a copy of my P.E. book and he had taken down the info to get himself one but after all his help and since we were at my house, I went inside and brought him out his own copy of the P.E. book and told him I hoped that would be payment enough for his help. He plans to go to church with me this Sunday and possibly bring his roommate also. Praise the Lord!! I got home at 0100. Praise God, there’s a new name written down in the Lambs Book of Life!! Bro. Jack, I don’t think so. Not sure though. Need to look into it.. Thanks for that link to Ray Stanford’s audios and writings. I was not aware of it. Yes, I am concerned about those pastors in Egypt.. Christians are being persecuted now that the Muslim Brotherhood and the radicals are taking charge. And to think Obama is still sending billions of American tax dollars to support the Egyptian Regime. Great!! I wish I could find a recording of the 1964 Christmas Concert and Ray’s message where I trusted Christ as my Savior. I scrounged through a table full of old tape recordings while I was attending the 2002 reunion but could not find it. Thanks David — does BBN have any Ray Stanford recordings? Thanks for letting us know that God used Ray to bring both of you to Christ. I hope his ministries in Egypt with 100 pastors will be able to bring more souls to the Lord till the Rapture. Praise the Lord. Good to hear from you — Think about it.. your ministry, church, Bible college and Seminary in the Turks and Caicos Islands and in India are indirectly a result of the faithfulness of Ray Stanford and/or those he led to Christ. Truly amazing the outreach the Lord has through Ray’s faithfulness with the Gospel. What a blessing I’ve received from his clear teachings, I am sad for our loss, but so blessed & thankful for HIS gain as he’s now been received to Glory, as Asaph said, Ps. 73:23-26. Thank you bro. Jack for that warm eulogy, I look forward to meeting bro. Ray there, you,either here or there, but of course only after I’ve spent a few thousand years worshipping at our Savior’s beautiful Feet! I too was led to the Lord by Ray, but on August 2nd, 1972. As a matter of fact, I just got done listening yesterday afternoon to the message he gave WHEN I trusted Christ! I am eternally grateful to him for having the love for souls that he did. I am also forever grateful for learning sound doctrine when I went to FBC. What a gift that was! Over the years I have worked with many who have struggled with false doctrines they had received much of their lives in other churches, ministries, and colleges. Two weeks ago I started a new Sunday School unit on, you guessed it, Personal Evangelism. The basis for the series? “ The Handbook of Personal Evangelism” by A. Ray Stanford. It is still the best book there is for learning how to witness for Christ. If anyone would like a free copy of it in PDF, contact me. I will email it to you. It is also available for free in several Bible Study Software packages. Also, I still use the hand gesture when explaining the gospel. I have never seen any method better in keeping peoples’ attention and making it clear. Thank you Ray for your faithfulness and for leading me to Christ. Jack, what an impact Ray had for the Lord! I am looking forward to meeting him! Lots of good memories and Heaven in our future!!! I am amazed when I think about how many folks were influenced by Ray..
Take care and enjoy sharing our Savior.